Papley re-signs Hear from Tom Papley after he re-signs for 2 more years. 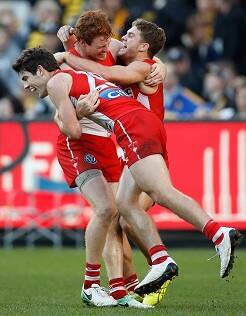 George Hewett and Tom Papley celebrate a goal against Richmond in 2017 with Gary Rohan at the MCG. Exciting Swans duo George Hewett and Tom Papley have committed to Sydney, signing two-year contract extensions with the club. In a boost for the team in the first week of pre-season training, the pair will now remain in red and white until at least the end of 2020. The Swans recruited Hewett, who was the youngest player taken in his draft class, with pick 32 in the 2013 AFL Draft. Hailing from the country town of Port Broughton in South Australia, Hewett settled in well to life in Sydney but had to bide his time learning his craft in the NEAFL for the first two seasons on the Swans’ list. Called up to make his debut in Round 1, 2016 against Collingwood, Hewett took his chance at the elite level, playing 48 games out of a possible 50 to become an integral member of the team. The 21-year-old finished fifth in Sydney’s Club Champion Award this year, behind Luke Parker, Lance Franklin, Jake Lloyd and captain Josh Kennedy. Joining Hewett in his debut match was small forward Papley, who made a stunning rise from an apprentice plumber to joining the Swans as a rookie at the end of 2015 and becoming a regular in the senior side. The grandson of former Swans players Max Papley and Jeff Bray made an immediate impact, kicking 29 goals in his debut year. The 21-year-old from Bunyip in country Victoria pushed into the midfield in 2017 where his hardness, skill and competitiveness were on full display. Sydney Swans Head of Football Tom Harley says the Club’s excited to have locked in the pair. “We are rapt to have secured the commitment of both Tom Papley and George Hewett until at least the end of 2020,” Harley said. “Tom’s development during his two seasons with the Swans has been significant. He came to us via the Rookie Draft to service a specific need and impacted immediately. We love his natural competitive drive and see him playing a large role in the future. “Meanwhile George’s consistent form and durability over the past two seasons since his debut culminated in a top five Club Champion finish in 2017. “The fact that George didn’t debut until his third year with the Swans is a credit to his character and resilience. He is an extremely trusted and respected member of the playing group. Hewett and Papley join Isaac Heeney, Callum Mills, Sam Reid, Will Hayward, Zak Jones, Oliver Florent, Jordan Dawson, Lewis Melican and Darcy Cameron in recommitting to Sydney in 2017.